Not only will you be able to interact with dolphins, you will also get to meet the manatees, sea lions and snorkel with sting rays and nurse sharks. This complete sea life discovery program includes a Royal Swim, and encounters with both the sea lions and manatees. You can also snorkel with the sharks and sting rays. Children must be at least eight years old or 4′ in height to participate in this program. Children must be accompanied by a paying adult. 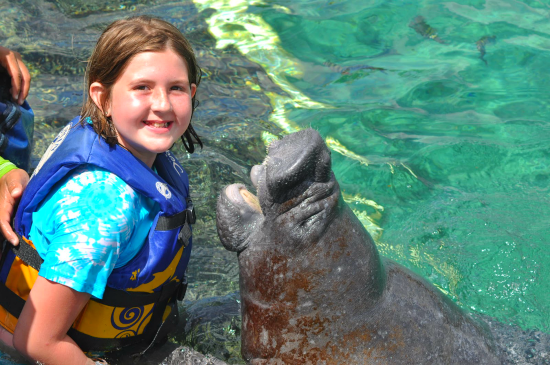 Children must be at least 8 years old for the sea lion encounter, there is no age limit for the manatee encounter. Discounts applied at time of booking. You can add Garrafon park to any of the dolphin swims. In addition to your dolphin experience and access to the facilities, you can include a visit to Garrafon park where you can zip line over the sea, kayak, snorkel with tropical fish, or laze back in the pool overlooking the turquoise waters. On site, you also have access to an all inclusive buffet restaurant and drinks. Click the following links to book what will be the most amazing and memorable day of your vacation. Early Booking Discounts Apply to the Dolphin Swims! Roundtrip catamaran to Isla Mujeres, lockers, showers, life jackets, access to swimming pools, buffet lunch and open bar with national brand drinks. You are responsible for getting to the pier in Cancun. * Book early and save $. Book more than 30 days prior to arrival and save 20%. Book between 7-30 days and save 15%. * There is a $6US dock fee that must be paid by every passenger, including children under 5. * Please wear biodegradable sunscreen and remove jewelry that may scratch the dolphins. * Bring a piece of ID to sign our locker keys, or sign out equipment in Garrafon park. * Bring your own towels and wear water shoes if you have them. Children under 4′ in height (1.2 meters) must be accompanied by an adult. If you are pregnant, 5 months or less, you are permitted to participate in this program as long as you are with another paying adult and sign the responsibility form. This is a great activity for children providing they are not afraid of the water. For smaller children, the Dolphin Encounter is recommended. Child sized life jackets are available and mandatory for all swims. The dolphin site is wheelchair friendly, however, they do not have a hoist available for the dolphin swims. There are several stairs to manipulate in order to gain access to the swimming area. Garrafon park is not recommended. Please feel free to contact us for additional information. Photos, souvenirs, $6 dock fee per person if sailing from Cancun. 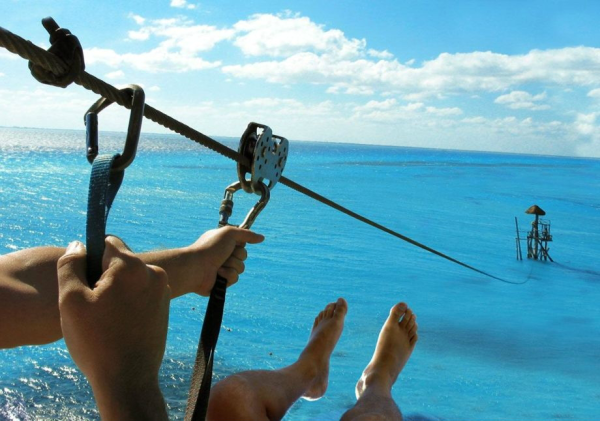 Additional activities in Isla Mujeres.